Those of us who live in Todos Santos are quite familiar with the famous visitors to our area –grey whales, leatherback turtles, whale sharks. It is thrilling to observe and interact with these amazing creatures and many of us eagerly look forward to their arrival each year. But there are also a number of animal and plant species that we can enjoy all year round – many of which are endemic to our area – and summer is a great time to search out some of these. We actually have 6 bird species endemic to Baja, 5 of which occur only in Baja California Sur. These include the cape pygmy owl – found mainly in the pine and oak forests of the Sierra de la Laguna Mountains; Xantus’s hummingbird– found buzzing your head near any hummingbird feeder or bougainvillea clump; Baird’s Junco – which favors the mountain tops of southern Baja, grey thrashers – which you can probably spot in your garden; Belding’s yellowthroat – which you can see around the lagoon in Todos Santos; and the Mangrove Warbler (which also appears in parts of mainland Mexico and Central America). We have an incredible abundance of endemic and migratory species alike – 39% of the world’s total number of marine mammal species and 70% of the world’s total number of marine cetacean species live or migrate through here. One of the most fun to watch is the Flying Mobula. Often before seeing them you can often hear the flap, flap, flap of groups of them leaping through the water and landing on their bellies as they move through the ocean. Often confused with Manta Rays, these acrobats of the sea – often seen doing double flips, mid-air twirls and other feats – keep scientists guessing about their behavior; why do they jump? No one really knows. Probably just because they can! While the Flying Mobulas are fairly easy to spot (they’re the ones leaping through the air), the Vaquita Marina porpoise is probably one of the hardest species to spot. In fact, the Vaquita Marina, which is the world’s smallest marine mammal, has been labeled by conservation groups as the world’s rarest, most endangered porpoise. The decline in the Vaquita population is largely attributed to gill-netting by fishermen, many of whom are trying to catch another fish species endemic to the Sea of Cortez, the totoaba. The tiny Vaquita is joined in the Sea of Cortez by the world’s largest animal, the blue whale. The Sea of Cortez also has resident populations of fin whales and sperm whales that do not migrate annually. Roughly 10% of the animals in the Baja desert are endemic to the area including Kangaroo rats, Baja ground squirrels and the mischievous babisuri (ring-tailed cat). If you’ve been camping on Isla Espiritu Santo, you’ve likely heard these night prowlers knocking about the camp kitchen looking for treats. Approximately 23% of plants on the Baja peninsula are endemic to the area, including the ubiquitous Cardón Cactus. The cardón is one of the most massive of all cacti – it can weigh up to 25 tons and grow as tall as 18 meters, although 10 meters is the average. It is a slow growing plant with a life span measured in hundreds of years. In fact, it is not until a cardón reaches about 80 years of age that it will start producing side branches – consider that the next time you walk past one of the massive cardóns we have around Todos Santos! It is not unusual for a cardón to have as many as 25 vertical branches, each up to 1.5 meters / 5 feet in diameter, and, in older plants, typically taller than the trunk. Another endemic plant that grows to a ripe old age in the Baja desert has been termed “one of the wackiest looking plants in the whole wide world,” and if you’ve ever driven between Todos Santos and Ensenada, chances are you’ve seen these groves of Cirio Plants. Looking like something straight from the imagination of Dr. Seuss, Cirios resemble nothing so much as giant, inverted carrots with spiny branches all over. The Spanish named them Cirio plants after the tall wax candles used in their churches, and subsequent visitors dubbed them Boojum Trees, a name taken from Lewis Carroll’s poem, The Hunting of the Snark. Whatever you call them they are definitely wild looking things that grow to great heights – up to 18 meters – vying with the Cardón Cactus for the title of Tallest Plant in Baja. Because of this height, Boojum trees are great places to spot Baja’s predatory birds, who use the height advantage of the plant to spot pray as well as to nest in safety. Also like the Cardón, Boojum trees can live for centuries. It takes them about 27 years to grow one meter, which means that some of the taller specimens you see are up to 500 years old. So next time you’re out walking among our enormous desert plants, consider that they might have been seedlings when the conquistadores arrived. These are just a few of the strange and wonderful flora and fauna that inhabit the Baja Peninsula. Please join us at Todos Santos Eco Adventures for one of our many adventures to explore the vast beauty of our home on the Baja peninsula. 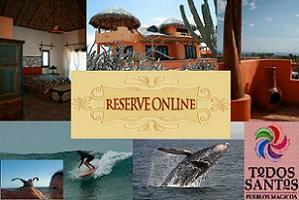 To arrange an eco-adventure in Baja California Sur with the author, click here.